“A universal quantum computer still is a vision. Special quantum systems that promise to solve certain tasks more quickly than a classical computer, however, are already playing an important role in science. To reliably find a certain element in unsorted data, a conventional computer has to run through all search elements successively in the most unfavorable case. A quantum system with an implemented Grover’s search algorithm quadratically accelerates search. 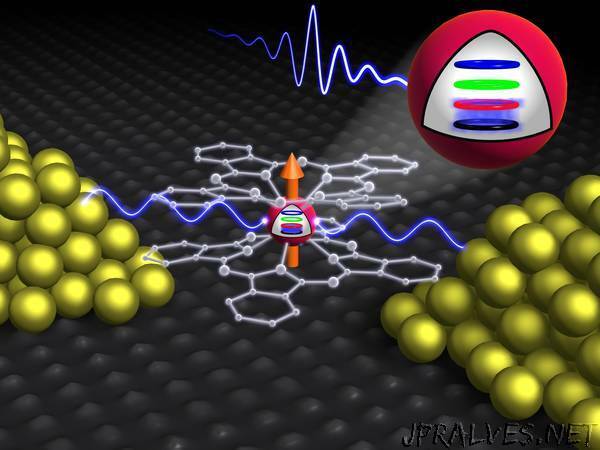 Research teams headed by Professors Wolfgang Wernsdorfer and Mario Ruben of KIT, together with scientists of the Institut Néel (Grenoble), have succeeded in doing this: The scientists applied Grover’s algorithm to a molecular magnet and, thus, created a quantum system, whose task is the rapid finding of search elements in unsorted data. In their latest research project, they demonstrated feasibility of a quick search for a small database of four elements. “But this method can be implemented in any quantum system with many, non-equidistant energy levels, which opens up the way towards a universal quantum search algorithm,” Professor Ruben says.